"BBI is Philippe BUSSONNET on bass (MAGMA since 1995, ONE SHOT), Jean-Claude BUIRE on drums (OFFERING in the late 80s - playing on "3" & "A-Fiïeh") & Laurent IMPERATO on guitar (founder member of XAAL - although not playing on any of their 2 CDs). This was recorded in 1996 but never released before. 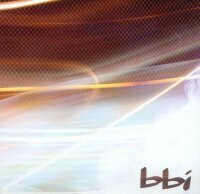 BBI is a power trio that mixes the rockiest side of ONE SHOT with the intense electricity of KING CRIMSON circa "Red" (minus the vocals, it's all instrumental). Intense & powerful, this smokes & Ph. Bussonnet adds his massive bass sound. Three of the six tracks (those written by Ph. Bussonnet) were later recorded (differently) by ONE SHOT on their first CD (now oop) three years later, in 1999." [Soleil Zeuhl website] ZNRadds: This is first-rate powerful fusion guitar music that avoids so many of the cliches that plague otherwise good albums in that genre. To be sure, there are many sections on this CD that listeners will find easy comparisons for, but many parts are fairly unique and ultimately this is a very satisfying album for fans of the instrumental fusion genre. Especially interesting are Imperato's guitar parts because he sidesteps so many of the standard 'soloing' conventions and makes his way through this style with imagination and verve! Notify me of updates to bbi "bbi"